I would like to say that I`m lucky to make 6-figure every month. But to be honest, running a 6 and 7-figure business has nothing to do with luck. It´s all about MINDSET and SKILLS. It saddens me to see how many creatives give up on their dream because they struggle to make money. They blame themselves, lose confidence and doubt if they are good enough – when really, what they lack is business know-how. It can be super depressing and frightening to realize that you do not make enough money to cover your monthly expenses. You feel lost and alone. Like you are this huge failure that cannot figure out how to make a living doing what you love. I know the feeling. I´ve been there. As a young mother in my early twenties, I collected empty bottles in the streets and exchanged them for money, so that we could get something to eat. It was not my proudest moment, but I was broke. I was a young, frustrated + struggling artist. And I gave up my dream back then because I wanted a better life for my children. Today, many years later I wish I knew back then what I know today. 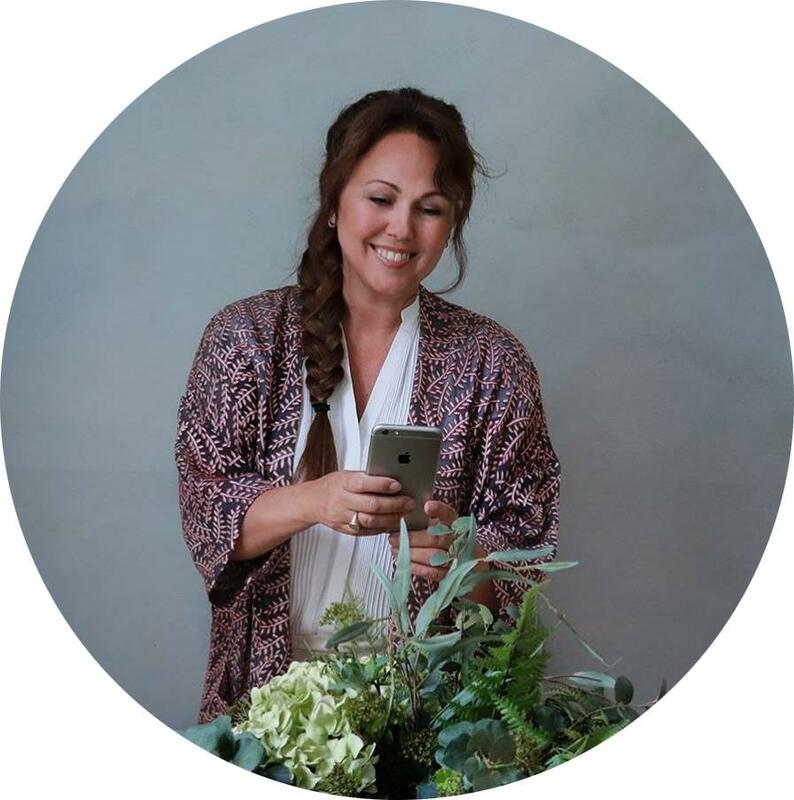 “My business is not making enough money, how can I increase cash flow so that I can afford to pay my bills and so I don´t have to worry about money ever again? So, today I’m sharing the top five reasons why creatives don´t make money with their businesses. These are POWERFUL steps, and if you commit, you’re well on your way to making it work. Don’t freak out if some of these apply to you, because it´s totally normal. The first step to change is to acknowledge you need change. Being real and honest with yourself will help you get things back on track. Let me ask you this; are you fully and totally 100% committed to making money? If you do not do at least ONE thing daily to grow your bank account, grow your profit and sky-rocket your sales – you are not fully committed. You got to let go of that old story about the struggling artist and be laser-focused on growing your income. I didn´t start to make money in my business until I decided. I decided that this is what I want and I wouldn’t accept anything less. I stopped giving up and backing off, and I made a conscious choice to believe that I could have whatever I wanted. Making money starts with a mindset shift and a whole lot of action. This is you being really clear on what you want, stepping up, and doing the work. 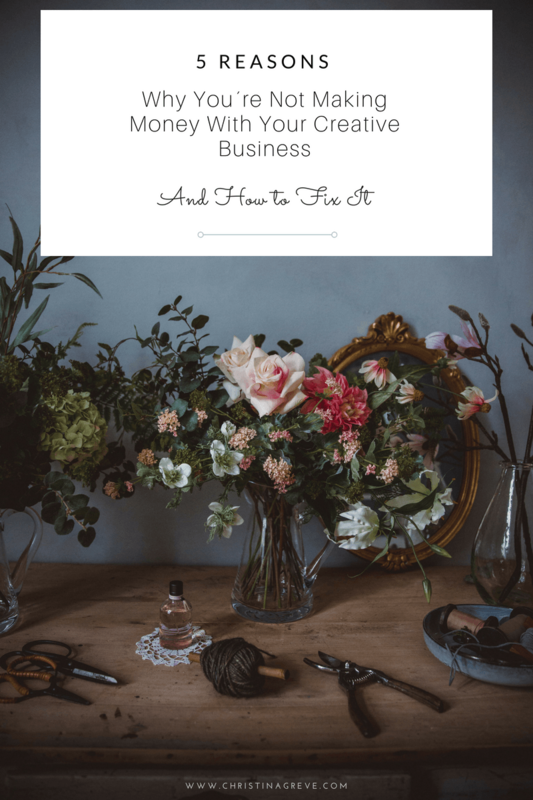 So if you want a profitable business, the first step is deciding that’s what you want, and that’s what you’ll have… because there’s no other option. KEY TAKEAWAY: Every day ask yourself; “what action can I take today to actually put money in my bank account?” Asking yourself this question will help you focus and get what you want. The number one reason why so many women don´t make money in their business is that they don´t show up. They hide, thinking it´s so much easier to play safe and color so far inside the lines that they don´t stand out as being too much. As humans… we crave safety. It’s one of the top human needs. We need to feel safe. So when presented with the idea of getting out from our hiding place… it can feel terrifying!!!!! Perhaps you know the feeling. You want success with your creative passion, but you avoid showing yourself to the world – hoping that one day will be your lucky day and someone will discover you. Have you ever noticed how much time you spend presenting the EVIDENCE about why you need to hide and play small? But here´s the truth; visibility is critical to the success of your business: people can’t pay you if they can’t find you. “Someday”, will not make you a profitable + successful business. “Someday”, is an excuse to hide and play small. And YOU are better than that! You have SO MUCH to offer. And it doesn’t do anybody any good if you keep it to yourself. You’re done disappearing into the background. Beige was never your color anyway. Now, is when you stop hiding. Now, is when you forget about “someday” and act TODAY! This is your time to step out into the light and show the world what you have to offer. KEY TAKEAWAY: You can’t wait for a miracle, sign, or lucky break. You have to make your own luck. If you are serious about your dream, you must go for it – every day! What we don’t seem to realize is that perfectionism is the enemy of done. CREATING something and being WILLING to share it with the world is super important. Why? Because though your content might not be perfect, it will help people who were once in your shoes. You don´t have to be an expert; you just need to be a small step ahead of those you wish to help. And if you help and inspire people, that´s an accomplishment in itself, regardless of your need to be “perfect”. Let´s be real. To run a profitable business, you need to create products and content that solve your clients biggest pain points. And this takes time and effort to create. Many business owners get overwhelmed just by the thought of this. They want to make the perfect product, the perfect newsletter, take the perfect photo for Instagram or write perfect caption for social media. But you can´t create perfect stuff all the time… and if this is your goal, you´ll most likely never get your business up and running. Instead of berating yourself for messing up and stumbling backwards, give yourself a warm-hearted pat on the back for trying, for making progress, and putting things out there. KEY TAKEAWAY: Solving problems your clients have is more important than you showing up perfect. If you are confused about exactly who your target audience is and what position to take in your industry, you will struggle to make money – it´s that simple. #1: What do your customers want and need most? #2: What are their pain points, that is, the most urgent problems that they need to solve? #3: How can you help them? Customers are looking for solutions and if they are confused about how you can help them or if they don´t understand the exact benefits from working with you – they´ll move on. With so many websites and businesses online, you need to answer that question from the moment they show up at your website or discover one of your products online. KEY TAKEAWAY: Get really clear on the value you provide your clients and charge accordingly. Do you get a dry cotton mouth when people ask you how much you charge? Do you avoid selling your products and service because you are afraid to appear pushy, salesy or icky? If so, you are not alone. From working with thousands of women around the world, I´d say that 95% of creative women feel this way. The number one excuse for not going for the sale is lack of confidence. But here´s the truth. It´s not lack of confidence. It´s lack of skills. How can you be a world-class sales queen when no one never taught you how? I mean, no one wakes up one day thinking; “I´m going to be a professional ballerina”, and then the next day dance with the New York ballet, right. You need to learn how to promote yourself. You need to learn how to communicate to your desired audience. And you got to learn how to love selling. And just to be clear; selling is not about being annoying, or trying to force your products on someone. Selling is LOVE. If you love what you do, all you sell is LOVE. Selling is sharing inspiration. If you feel inspired to inspire others, all you sell is inspiration. Selling is storytelling. Forget icky sales emails. Talk about your journey. Share how you got from where you were to where you are today. Share how you overcame your struggles and how you now are ready to help people who are in a similar situation as you once were. KEY TAKEAWAY: Talk about the experience and the benefits people will get by working with you. Be passionate about what you do and what you offer and share your excitement. Alright, that´s it for today. Now commit to changing just ONE thing at a time. Allow yourself to step outside your comfort zone because it´s outside your comfort zone you will sky-rocket your profit. Need help going from BUSINESS overwhelm to six-figure PROFIT, IMPACT AND FREEDOM? The doors for my exclusive program Optimize Your Creative Life are now open! I poured my heart and soul into this program because I know what it’s like to race from task to task but nowhere closer to your income goals. EXACTLY what you should be doing each day so you can actually make some MONEY! Branding yourself to stand out like the creative star you were born to be. Mastering and knowing your target audience so you know exactly who you’re serving and how to sell to them. Designing your signature products like a pro to bring in the revenue you deserve and leave your audience hungry for more. Overcoming your money blocks so you can develop a 6-figure mindset and skyrocket your income. The exact workflow you need to follow so you can stay in your zone of genius without the burn-out. Building automation and systems that let you step out of your business and into your power and make money while you’re sleeping. The Art of crafting your website, sales page and sales script. No more guessing. You get all of my templates! Turning your creative skills into a profitable online course, so you can work from home in your yoga pants while helping a ton of people around the world. Sign up today and join this life-changing program!